Jeffrey Rink, Conductor “...Rink conducts a World-Class Concert Otello...” said the Boston Globe, “Boston’s pre-eminent Verdi conductor” said the Boston Phoenix, “...Rink affirmed that he is a conductor who understands and faithfully the observes the intentions of the composer, musically elegant, precise and efficient without excessive movement...” said Switzerland’s La Liberté. His recent performance of Mahler's Symphony No. 4 was described by Alejandro Fernández in Mexico's El Norte as "miraculously balanced." and Mexico City’s El Economista called him “...among the best of his generation of conductors...”. 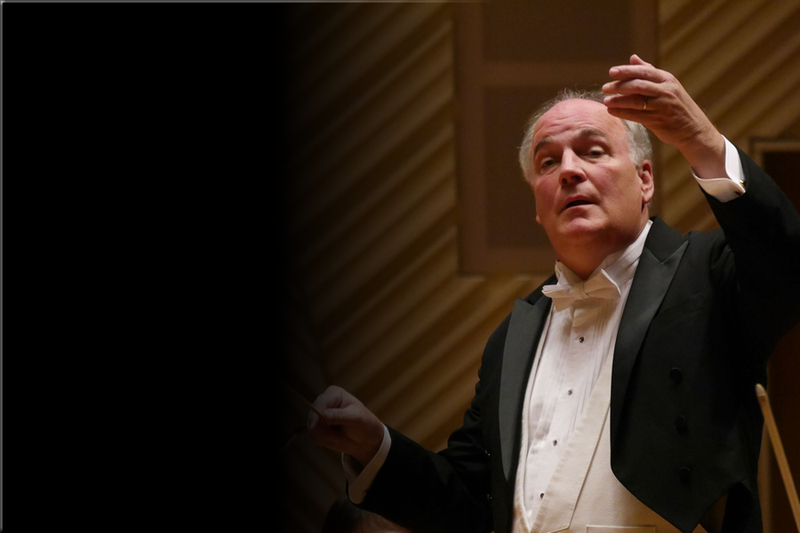 Recipient of the Jacopo Peri Award for outstanding contributions to the art of Opera, Mr. Rink served from 2007-2018 as Music Director of the Northwest Florida Symphony Orchestra. As guest conductor he led a production of La Bohème with the Maryland Opera Theatre which was praised by the Washington Post as “good as any "Bohème" you are likely to see this side of the Metropolitan Opera or Covent Garden.” A regular musical presence in Japan he has led the New Japan Philharmonic, Tokyo Symphony Orchestra, Tokyo Philharmonic, Telemann Chamber Orchestra, Tokyo Amadeus Orchestra and Tokyo Blumen Philharmonie. He has conducted sold-out performances of Chinese and Western music in Carnegie Hall, Avery Fisher and Alice Tully Halls as well as Boston’s Symphony Hall. While in Boston Mr. Rink served as Music Director of Chorus pro Musica, the Newton Symphony Orchestra, the New England Philharmonic, Concert Opera Boston and Director of Orchestral Activities at the Longy School of Music. Mr. Rink’s tenure with Chorus pro Musica and Concert Opera Boston was marked by numerous significant contributions to opera in concert version, including performances of Carmen, Faust, Samson et Dalila, Cavalleria Rusticana, Pagliacci, Turandot, Otello, Macbeth, Nabucco, La Traviata, Mefistofele and the Boston premiere of Verdi’s Attila. During Mr. Rink’s eight-year directorship of the New England Philharmonic the orchestra was nationally recognized in three of eight seasons by ASCAP for its adventuresome programming and commitment to new music, having played over twenty premieres. In 1986 he was appointed by Sir Christopher Hogwood as Assistant Conductor of the Handel & Haydn Society, a position that he held until the summer of 1990. He has received high praise from the Boston Globe, the Washington Post, New Yorker Magazine, the London Musical Times, Poland’s Glos Wybrzeza, Mexico’s El Economista, El Norte and El Informador, the Manila Standard and Switzerland’s La Liberté. While in Boston he conducted the Boston premieres of Handel’s Esther, Verdi's Attila and La Cantata Criolla of Estėvez as well as the North American premieres of Berlioz’s L’Enfance du Christ and Roméo et Juliette with period instruments. With the Tokyo Philharmonic he conducted an all-Berlioz program featuring the recently-discovered Messe Solonnelle. For two seasons he served as a cover conductor for the Boston Symphony Orchestra and Boston Pops assisting James Levine, James Conlon, Hans Graf, Robert Spano, Rafael Frübeck de Burgos, Sir Colin Davis, Gennady Rozhdestvensky and Keith Lockhart. In addition to his performances with the Northwest Florida Symphony Orchestra Mr. Rink's recent concerts include appearances with the Chamber Orchestra of the Palacio de Bellas Artes in Mexico City, a performance of Bach’s Mass in B minor in Tokyo’s Suntory Hall, Mahler Symphonies 2 , 5 and 8 with the Tokyo Blumen Philharmonie and Tokyo Amadeus Orchestra, performances with the Teatro Lirico d’Europa’s productions of Rigoletto, Aida and Turandot, a tour with the Opera Company of Middlebury (VT) of Donizetti’s L’Elisir d’amore, an all-Russian program with the Newfoundland Symphony Orchestra and Beethoven’s Missa Solemnis with the Tokyo Oratorio Society. He was a featured guest artist as the conductor of performances of La Traviata in Mexico's San Pedro Festival as well a performance of Mahler Symphony No. 2 in Tokyo in March 2011 as an emotional response to the earthquake and tsunami. In March 2019 he made his debut with a critcally-acclaimed all-German program with the Orquesta Filarmónica de Jalisco and in June 2019 will make his debut with the Orquesta Filharmónica de Boca del Río in Veracruz, Mexico. In October 2019 he returns to the Opera Company of Middlebury (VT).